Over the last century, machines have replaced workers in many tasks. On balance, however, technology has created more jobs than it has displaced (Frey and Rahbari 2016). Technological progress has transformed living standards. Life expectancy has gone up; basic health care and education are widespread, andmost people have seen their incomes rise. And yet, fears of robot-induced unemployment often dominate discussions over the future of work. The World Bank’s recently launched World Development Report for 2019 on The Changing Nature of Work (World Bank 2019) addresses these issues, analysing what exactly is changing and what needs to be done. The report argues that, on balance, concerns about robot-induced unemployment appear to be unfounded. 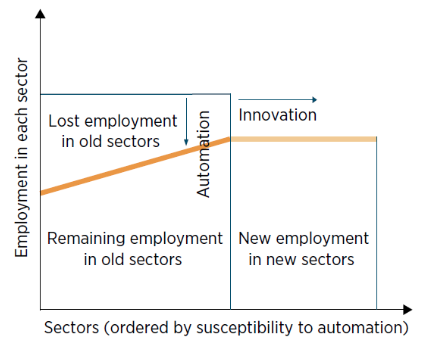 Instead, the future of work is driven by the competing forces of automation and innovation, the other ‘AI’ (Figure 1). Note: The ordering of the sectors in the figure should be understood as running from the most automatable to the least automatable, or from the low-skill and middle-skill jobs to high-skill jobs where there is a decline in the relative demand for some less educated workers. Technological progress enables firms to automate, replacing labour with machines in production, and to innovate, expanding the number of sectors, tasks, and products. The pace of innovation will determine whether new jobs or tasks emerge to counterbalance the decline of old, routine-based jobs. For example, recent evidence for Europe suggests that while technology replaces some workers, it also raises labour demand. Overall, technology that replaces routine work is estimated to have created more than 23 million jobs across Europe from 1999 to 2016 (Gregory et al. 2016). The report casts its net wider than an attempt to predict the number of jobs that technology may create or destroy, focusing instead on the changing nature of the firm, its impact on skills and the terms on which people work, and how government policy should be reoriented in response. The digital economy has expanded firm boundaries and driven a fundamental shift in the nature of firms. Physical presence is no longer a prerequisite to doing business: companies provide online services from abroad or profit from intangible assets such as software and intellectual property; digital platforms generate income from the capital of others. 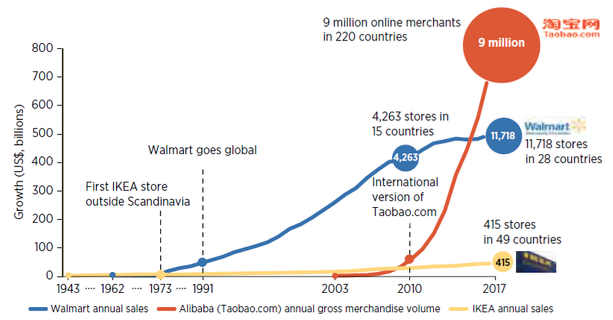 Firms in the digital economy can evolve much faster from local start-ups to global behemoths, often with few employees or tangible assets (Figure 2). For governments, identifying where value is created in the digital economy—and capturing some of those corporate gains—is not always straightforward, particularly when it comes to user data. Under these circumstances, it has become easier for companies to locate assets (and subsequently profits) in countries with preferential corporate tax frameworks. Digital markets also provide new risks in the competition context. The changing nature of firms coincides with a shift in the demand for skills among workers. The demand for less-advanced skills that can be replaced by technology is declining. At the same time, the demand for advanced cognitive skills (Krueger and Kumar 2004), socio-behavioural skills (Cunningham and Villaseñor 2016), and skill combinations associated with greater adaptability arerising (Hanushek et al. 2017). The rise of platform marketplaces is also changing the way people work and the terms on which they work, through the so-called ‘gig economy’. Individuals and firms need only a broadband connection to trade goods and services on online platforms. This ‘scale without mass’ brings economic opportunity to millions of people who do not live in industrialised countries or even industrial areas (Brynjolfsson et al. 2008). That said, the number of gig economy workers remains small as a proportion of the overall workforce. Data is scarce but, where it does exist, the numbers are still low. Data from Germany and the Netherlands indicate that only 0.4% of the labour force in these countries is active in the gig economy. The report estimates that, worldwide, the total freelancer population is around 84 million, or less than 3% of the global labour force of 3.5 billion. A person counted as a freelancer may also have a regular salaried job. In the US, for example, more than two-thirds of its 57.3 million freelancers also hold a traditional job, turning to freelance work to supplement their income (Upwork 2017). The best estimate is that, globally, less than 0.5% of the active labour force participates in the gig economy. These changes in the nature of work have been more pronounced in advanced economies, particularly Europe and North America where the uptake and penetration of technology aregreater and labour markets are more developed. Correspondingly, the growth of the gig economy has raised alarm bells in those parts of the world because it blurs the divide between formal and informal work: in both cases, workers are typically in low-productivity employment, with most labour laws unclear on the roles and responsibilities of the employer versus the employee. This group of workers often lacks access to benefits. There are no pensions, no health or unemployment insurance schemes, and none of the protections provided to workers in long-term, contract-based employment. Governments have to invest more and better in lifelong learning if workers are to stand a chance of adjusting to future labour markets—from early childhood development programmes and formal schooling, through to higher education and adult learning programmes. But rethinking social protection systems is just as important. A formal wage employment contract is still the most common basis for the protections afforded by social insurance programmes and by regulations which, for instance, set a minimum wage or severance pay. The German chancellor Otto von Bismarck is acknowledged as the founder of social insurance—providing benefits for workers in the formal sector financed by dedicated taxes on wages. The system relies upon steady wage employment, clear definitions of the employer and employee relationship, and a fixed retirement date. But this contributory approach is beginning to look outdated as the changing nature of work disrupts these traditional norms. Technology shifts the demand for workers’ benefits from employers towards directly demanding welfare benefits from the state. Direct social assistance programmes also need to be revised to ensure that they guard against growing labour market risks. The evidence is irrefutable that cash transfers make positive contributions to the health and education of current and future generations of people. They reduce stress and depression, increase mental bandwidth, and foster more involved parenting. All of these undoubtedly make for happier, more productive households. But there is generally low uptake of social assistance. In the EU, only about 60% of social benefits are claimed (Eurofound 2015). This is due to a lack of information about such benefits, the stigma attached to them, and the bureaucratic hurdles required to be overcome in order to receive them. 'Universal basic income’ is the fashionable solution, but in truth, the world knows very little about how it would work in practice. Studies suggest the fiscal implications would be significant. 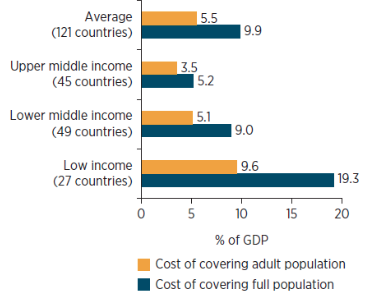 The cost of a universal basic income for adults set at the average poverty gap level ranges from 9.6% of GDP in low-income countries to 3.5% of GDP in upper-middle-income countries (Figure 3). A simulation for four European countries shows that a universal basic income would cost (if set at a level equal to existing cash transfer programmes) 13.8% of GDP in Finland, 10.1% in France, 8.9% in the UK, and 3.3% in Italy (Browne and Immervoll 2017). In each case, it was not always possible to offset the cost of the universal basic income simply by abolishing existing allowances. Other initiatives would have to be cut or taxes raised to provide the necessary cash. Sources: WDR 2019 team, based on World Bank's World Development Indicators (database) and PovcalNet and United Nations' World Population Prospects. Browne, J, and H Immervoll (2017), “Mechanics of replacing benefit systems with a basic income: Comparative results from a microsimulation approach”, Journal of Economic Inequality 15(4): 325–44. Brynjolfsson, E, A McAfee, M Sorell and F Zhu (2008), “Scale without mass: Business process replication and industry dynamics”, Harvard Business School Technology and Operations Management Unit Research Paper 07-016, Cambridge, MA. Cunningham, W, and P Villaseñor (2016), “Employer voices, employer demands, and implications for public skills development policy connecting the laborand education sectors”, World Bank Research Observer 31(1): 102–34. Eurofound (European Foundation for the Improvement of Living and Working Conditions) (2015), Access to social benefits: Reducing non-take-up, Publications Office of the European Union, Luxembourg. Frey, C B and E Rahbari (2016), “Technology at work: How the digital revolution is reshaping the global workforce”, VoxEU.org, 25 March. Gregory, T, A Salomons and U Zierahn (2016), “Racing with or against the machine? Evidence from Europe”, ZEW Discussion Paper 16-053, Center for European Economic Research (ZEW), Mannheim, Germany. Hanushek, EA, G Schwerdt, S Wiederhold and L Woessmann (2017), “Coping with change: International differences in the returns to skills”, Economics Letters 153(April): 15–19. Krueger, D, and KB Kumar (2004), “Skill-specific rather than general education: A reason for US-Europe growth differences?” Journal of Economic Growth 9(2): 167–207. Upwork (2017), Freelancing in America 2017 (database), Mountain View, CA. World Bank (2019), World Development Report 2019: The Changing Nature of Work. Washington, DC: World Bank.